Mendel’s laws of inheritance are of utmost importance in genetics. The laws of inheritance form the basic principles of biological inheritance. The laws were put forward by an Austrian monk and a scholar, Gregor Johann Mendel, also known as the ‘Father of Genetics’. Mendel carried out his experiments between the years 1856 and 1863, but it was not until 1900 that his work got recognised. The credit for rediscovering his work goes to Hugo de Vries, Carl Correns, and Erich von Tschermak. These three botanists were working independently and conducting the experiments on the plants in a similar way as Mendel did. What’s more surprising is that they even arrived at the similar conclusions and hence, brought his path-breaking work into the limelight. It was easy to cultivate. The generation time of the plant was relatively short; the entire generation grew in one season. The pea plants possess contrasting pairs of characters or traits which were easily distinguishable from each other. The flowers were bisexual (male and female flowers were present on the same plant), and so, the hybridisation experiments and emasculation were carried out easily. The plants underwent self-pollination; hence the plants were true-breeding. The hybrids were fertile, and therefore, subsequent progenies were successfully obtained. Alleles: Different versions of a gene are called alleles; for example, seed shape is determined by a gene that exists as two different alleles. One allele codes for round seeds and the other allele codes for wrinkled seeds. Locus (plural-loci): A specific position on the chromosome where an allele for any particular gene is present. Genotype: The genetic makeup of an organism or the set of alleles possessed by an organism. Homozygous: A diploid organism which possesses two identical alleles of a gene. Heterozygous: A diploid organism which possesses two different alleles of a gene. Phenotype: The observable features of an organism. It can refer to any characteristic, be it physical, physiological, behavioural or biochemical; for example, the condition of having round or wrinkled seed. Here, round and wrinkled are phenotypes. Dominant: The characters which are able to express themselves in a heterozygous condition. Recessive: The character whose expression is hidden in a heterozygous form. Wild-Type: The normal or the parental allele for a character. Punnett Square: A square diagram which predicts the genotypic and phenotypic ratios of a particular genetic cross. Test-Cross: The cross between an individual with an unknown genotype and an individual with a homozygous recessive genotype. Back-Cross: The cross between an individual of the F1 generation and either of the parents. 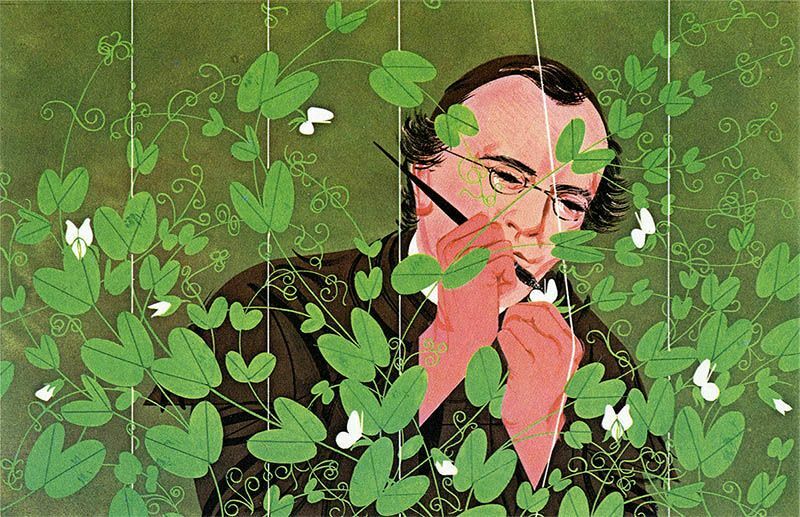 Gregor Mendel began his studies by studying monohybrid crosses. A monohybrid cross is a cross between parents which differ in a single characteristic. What did Monohybrid Crosses reveal? The plants in the F1 generation exhibited the phenotype of only one of the parents. However, they must have inherited genetic factors from both the parents, because both the phenotypes are present in the subsequent progeny, i.e. the F2 generation. The presence of both the phenotypes in the F2 generation is possible only when the F1 progeny possesses both the genetic factors; responsible for encoding a particular character. The genetic factors discovered by Mendel are denoted by letters; ‘R’ (represents allele for the round seeds) and ‘r’ (represents the allele for the wrinkled seeds). The pea plants in the P generation were homozygous or pure breeding for the traits and had two identical alleles; round-seeded plants had RR while wrinkled-seeded plants had rr. Mendel also observed that at the time of gamete formation, the two alleles in each plant separate. One allele goes into each gamete because when gametogenesis occurs, a zygote is produced by the fusion of gametes from each parent. An allele from the father combines with the allele from the mother, and henceforth, the genotype of the offspring is formed. The F1 plants inherited ‘R’ allele from the round-seeded parent and the ‘r’ allele from the wrinkled-seeded parent. Nonetheless, only ‘R’ allele was observed in all the F1 plants. We can easily refer to the ‘R’ allele as the dominant allele because it is able to express itself despite the presence of the other allele; ‘r’ allele is referred to as the recessive allele because its expression gets hidden. At the time of gametogenesis, the alleles of each parental plant separate into the gametes with equal probability. When the F1 plants with genotype, Rr, produced gametes, half of the gametes carried ‘R’ allele and half carried ‘r.’ These gametes, now, combined randomly to give rise to the following genotypes: ‘RR’, ‘Rr’, ‘rR’, and ‘rr.’ Since, the allele for the round seeds, R, is dominant and hence, three round seeds were produced for each wrinkled seed in the F2 generation; giving the phenotypic ratio as 3:1. Law I: The concept of dominance states that in the heterozygous condition, only the character with the dominant allele will appear in the progeny. This principle was further strengthened when Mendel self-fertilised the F2 plants to give rise to the F3 generation. The plants of the F3, which were grown from the wrinkled seeds (rr) of the F2 generation, were all wrinkled. Since wrinkled plants of the F2 were homozygous (rr) for the seed shape, they passed only the wrinkled allele for the trait to the next progeny. Law II: The law of segregation states that the two alleles possessed by a diploid organism segregate/separate at the time of gametogenesis and one allele goes into each gamete. The law of segregation was also consistent with the subsequent results obtained. Upon self-fertilising the round seeds (RR, Rr, and rR) of the F2 generation, both wrinkled and round seeds were produced. Nearly 2/3 round plants of the F2 produced both round and wrinkled seeds, and 1/3 F2 round plants gave rise to only round seeds. The heterozygous F2 plants produced 1/4 RR (round), 1/2 Rr (round), and 1/4 rr (wrinkled) seeds. The ratio of the round seeds to wrinkled seeds in the F3 was 3:1. The plants with genotype ‘RR’ could produce only round seeds whereas the plants with genotype ‘Rr’ produced both round and wrinkled seeds. Regardless of the number of generations, 2/3 round plants gave rise to both round and wrinkled seeds, and 1/3 gave rise to only round seeds. The phenotypic ratio in each progeny was 3:1 itself. Mendel further carried out his genetic experiments using those varieties of the pea plant which differed in two characteristics. When he crossed the pea plants with the contrasting pair of traits, they were known as the dihybrid crosses. What did dihybrid crosses reveal? The dihybrid cross reveals ‘The Law of Independent Assortment’. Law III: The Law of Independent Assortment states that the alleles at different loci segregate independently of one another. The principle of independent assortment must not be confused with the principle of segregation. The principle of independent assortment is an extension of the law of segregation. The law of segregation refers to the separation/segregation of alleles at the time of gametogenesis whereas the principle of independent assortment describes that when these two alleles separate, their separation is independent of the alleles at the other loci. R and Y separate together, and r and y separate together to give rise to the gametes with the alleles RY and ry. R and y separate together, and r and Y separate together to give rise to gametes with the alleles Ry and rY. Irrespective of the kind of segregation, an equal proportion of the four gametes, Ry, Ry, rY, and ry, are produced. These gametes have equal chances of combining with one another and henceforth yield 9:3:3:1 phenotypic ratio. However, the Mendelian ratios can deviate in case of incomplete dominance and co-dominance. Incomplete Dominance is a phenomenon whereby a dominant allele does not completely mask the expression of the recessive allele. The organism’s phenotype may show the blending of both the alleles; for example, flower colour in Mirabilis jalapa. It is also known as partial dominance or semi-dominance. Co-Dominance is a form of inheritance whereby both the alleles in a heterozygote fully express themselves. Neither of the two alleles is dominant over the other; for example, blood groups in human beings.